HUNTINGTON, W.Va. - When Brennan Amaral decided to come to Marshall University, he didn’t realize he would have the chance to possibly save a complete stranger’s life. But when the university held its annual DKMS Bone Marrow Donor Drive last spring, Brennan figured if he could potentially make a difference, it was something worth doing. 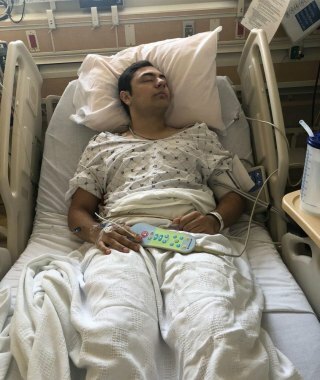 On July 2, 2018, Amaral, a sophomore public relations and advertising student from Martinsburg, West Virginia, traveled to MedStar Georgetown University Hospital and its Lombardi Comprehensive Cancer Center to have part of his bone marrow removed. Immediately following the surgery, Amaral said he was in good spirits and feeling humbled by the entire experience. Amaral said the recovery will take a total of six to eight weeks due to the amount of bone marrow taken. Since the fall of 2016, Marshall’s DKMS student chapter has registered over 1,100 students, according to Adam Guthrie, DKMS chapter president. According to the DKMS website, someone is diagnosed with a blood cancer every 3 minutes in the U.S. For many patients, a bone marrow or stem cell transplant is the best chance for survival. Amaral and Guthrie both encourage interested donors to learn more about the process by visiting DKMS.org.